My first book, The Parent’s Toolkit, was all about tools and strategies for parents to help their children navigate life and help them with any problems that they had. My second – co-written with Julia Hague – is something not too dissimilar and I would go as far as saying it can complement the first. 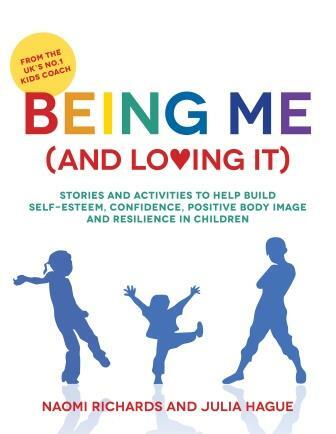 Being Me (And Loving it) is a collection of 29 real life and relatable stories that can be used as part of the PSHE programme in schools or used by parents with their children at home. It is a unique and unusual book that has been written to help build self-esteem, body confidence and resilience in children aged 5-11. It also helps children with friendship issues, social media understanding, peer pressure, puberty and body image. Each story focuses on one prevalent issue that children face and has a host of activities (over 100) and discussion points that parents can use with their child. When used by educators, youth workers, school counsellors, pastoral care teams and those delivering PSHE lessons there is guidance on how to introduce each topic and story, learning outcomes as well as pre and post-lesson exercises. It can be used with one child or the whole class. Being Me (And Loving it) is not just for one audience! Where can I get ‘Being Me (And Loving It)’? Lorna Jackson MA., BA (Hons), CPOD, AASW, CQSW Professional Advisor Safeguarding in Education. “I feel that this is an excellent book – a wonderful tool for teaching staff, which could also be used in Brownies/Cubs groups and by other competent adults working with children. I do not see is so much as a book for parents, but can see it as useful to them. Each of the stories is carefully devised to cover a key topic and the writers have made it clear what ages it can best be used with.. As a PSHE tool for schools, each story is presented as a standalone lesson plan, with an introduction, learning objective, guidance pre- and post-story activities. Do you work with Primary-school aged children who need to boost their self-esteem? Try the WOW Board for Schools.